Designed to flatter, this full-length convertible soft tulle wrap dress can be tied in a variety of ways to flatter multiple body shapes. 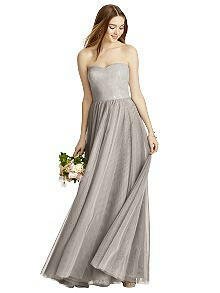 With a strapless sequin bodice and shirred skirt, the personalized silhouette features a metallic shimmer. Fit Tip: The natural waist and bust measurement take priority for style 4502. If you are over by an inch or two on the hip it is not a problem. There is plenty of extra room in the skirt to accommodate.